When it comes to dinner recipes, I usually find myself asking "Would that make good leftovers?". Since there are only 2 of us, most recipes yield leftovers. Leftovers make great lunches for both of us to eat on during the week, but some things are easier to take to work than others, especially if your work consists of sitting in a plane most of the day. With that, I try to make recipes that are great for "grab and go". 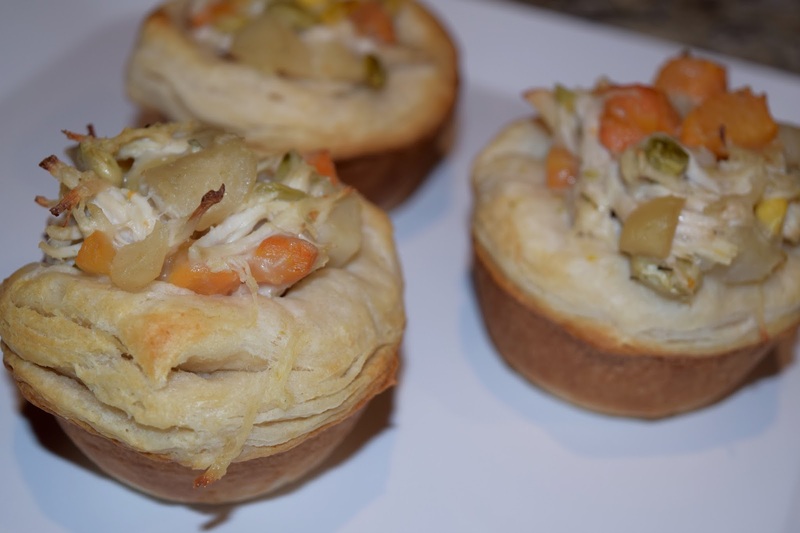 When my sister recommended this recipe for Chicken Pot Pie Cups, I was instantly sold! So sold, that I went to the store and made them the very next day. If I have the time, there is nothing better than chicken pot pie with a homemade crust. Talk about the ultimate comfort food. You won't see me buying store bought crusts (I was too spoiled as a kid with the good stuff, which can be both a blessing and a curse), but store bought biscuits are a different story! And that, my friends, is precisely what these little pies of joy are made of. How can you not love something in a biscuit?! 1. Preheat oven to 400 degrees and spray a muffin tin liberally with cooking spray. 2. In a large bowl, combine all ingredients except for biscuits. 3. Place a biscuit into each muffin cup, lightly pressing into the bottom and up the sides. 4. 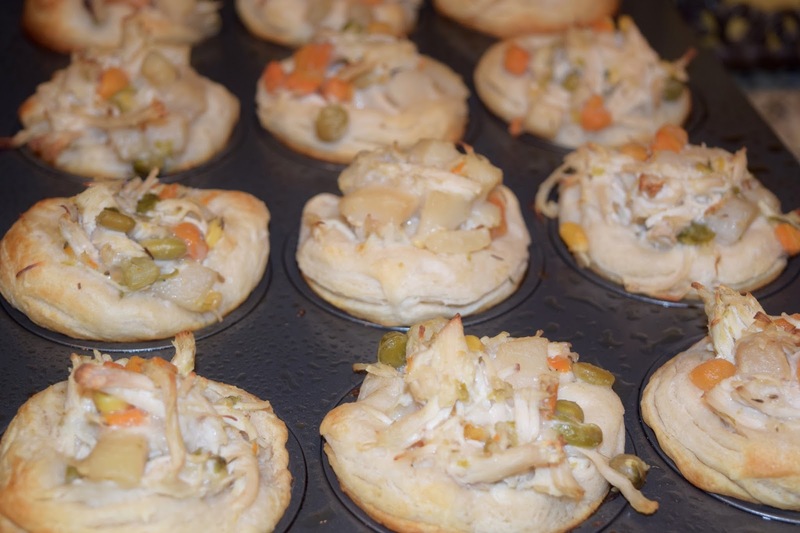 Evenly fill each biscuit cup with chicken mixture. 5. Bake 12-15 minutes or until biscuits are golden brown. I've made something like this too and they are so delicious! We make these a lot! So yummy and easy! These look amazing! I'd be worried about eating all of them by myself. Ha! 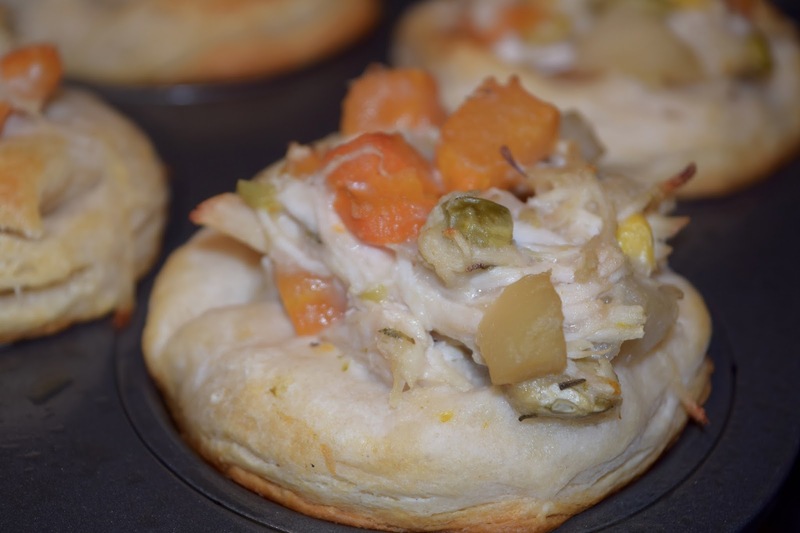 I just made turkey pot pies with biscuit dough, haha. I froze them, so we'll have to see how they turn out.